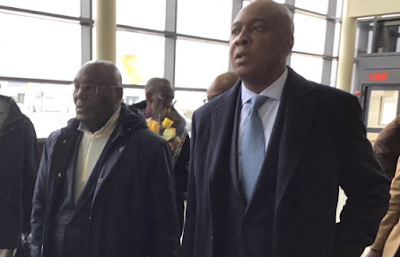 The Coalition of United Political Parties on Thursday said it has uncovered an alleged plan by the Federal Government to implicate the presidential candidate of the Peoples Democratic Party, Alhaji Atiku Abubakar, in a case of alleged gunrunning and perpetuating electoral violence. It claimed that the President of the Senate, Bukola Saraki; Senator Dino Melaye and other opposition leaders are also targeted in the plot. The coalition’s spokesman, Imo Ugochinyere, made the allegation in a statement made available to journalists. He said, “Elements of the ruling party have commenced the branding of some vehicles with the colours of the opposition bearing the photos of these opposition leaders and have acquired arms which will be hidden in the vehicles and the vehicles will be driven to join the campaign convoy of the opposition consensus candidate in Kwara, Kogi and Adamawa and other parts of the country where they have also selected. “The vehicles will eventually be searched by the police and the arms recovered. “Their plot will include mobilising thugs and causing violence on the day of such recovery so as to tag the opposition as violent. “The APC leaders are aware Nigerians now know them for their violence which has trailed their campaigns nationwide.